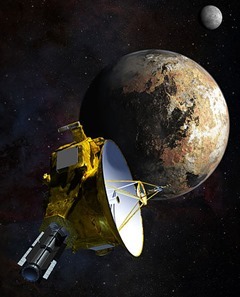 Today, New Horizons will make its closest approach to Pluto. It has already sent us some fantastic views from the dwarf-planet-formally-known-as-the-ninth-planet and it will likely send back many more. We’ll learn a lot from the information that New Horizons sends us. I would be remiss to pass up this opportunity to geek out. My first instinct would be to take the distance between Earth and Pluto and figure out how long it would take to get there via various “normal transportation” means. Before I do that, though, it turns out that Adam Frank from NPR already did this. As much as I’d love to do the math again, let’s flip it around. Instead of figuring out how long it would take to drive to Pluto, let’s imagine you could get in a car that travels at 32,400 miles per hour – the speed New Horizons is moving at. Let’s suppose you could use this car to make various journeys. How quick would those travels be? First, some ground rules. We’re going to assume that there is no traffic – no sense in having a car that can go 32,400 miles per hour when there’s a line of cars stopped ahead of it. We’re also going to assume that our can can take a straight line path without crashing. Personally, I’ve driven at 80 miles per hour and felt like I was beginning to lose control. I couldn’t imagine how out of control 32,400 would feel. Not crashing also means being able to go from 32,400 mph to a full stop without any occupants being injured in any way. I’ll often get invites to events in New York City. Sadly, I need to turn many of them down simply because it takes three hours to drive to the city from where I live. 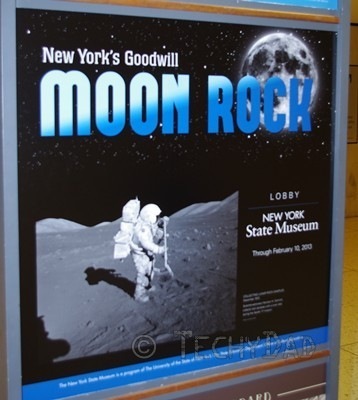 If I had a New Horizons Car, though, I’d be able to get to New York City in under twenty seconds. At that travel time, I could order a pizza from a New York City pizzeria and get there before they even began preparing my order. Maybe we need something a bit father away to drive to. It’s no secret that I’m a Disney fan. I’ve been in love with Disney World since B and I went there on our honeymoon I’ve loved it even more when we went there with the kids. Obviously, living in Upstate New York means that I can’t just stop by the Magic Kingdom. What if I had a New Horizons Car, though. Rounding up to the nearest 50 miles, it’s 1,250 miles to Disney World for me. With our space-age car, I could get the family to see Mickey in two minutes and twenty seconds. With that travel time, we wouldn’t even need the boys to bring any books to keep themselves occupied. We have some family on the opposite coast that we rarely get the chance to see. We’d love to see them more often, but cross-country flights are expensive. Driving cross-country would be out totally, but now we have a bright, shiny New Horizons car in the driveway. At about 2,850 miles to Los Angeles (rounding up to the nearest 50 again), it would take less than five and a half minutes to get to LA. Let’s push the limits a bit more. Since the continental United States seems so small for New Horizons Car, what about something on a bit more global a scale. How long would it take to drive to Hong Kong? (We’ll assume we can somehow drive on water while maintaining the speed.) Hong Kong is about 7,950 miles away which would mean New Horizons Car could get there in under fifteen minutes. Yes, I could travel from my house to Hong Kong and back in the time it takes for a half hour television show (including commercials) to air. Let’s do one more trip: To New York City. Yes, I know, we’ve done this already, but this time we’re going to take the “scenic route.” To be specific, we would travel west around the entire world until we came back around to New York City. Essentially, this would be circumnavigating the world so I’d need to know the circumference of the Earth at New York City’s latitude. Luckily, this website lists all of these so it was trivial to find out that I would need to travel 30,741.789 kilometers or 19,102 miles. At New Horizon speeds, this would take just over 35 minutes. Given how mind-bogglingly big space is, it’s easy to forget how fast these craft are traveling at. Were we to apply these speeds to our daily modes of travel, our world would shrink dramatically. 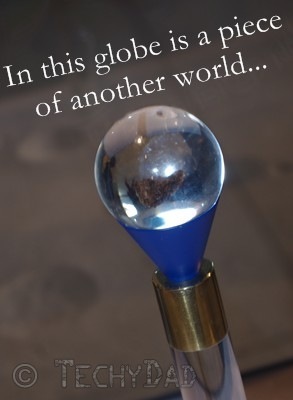 We would be able to go anywhere on the globe in a matter of seconds. While I might not have a car that could take me to Disney World before a microwave meal completes, I will enjoy all of the images that New Horizons sends back as it passes Pluto on its journey deep into space. NOTE: The New Horizons image above is comes from NASA via Wikipedia and is in the public domain. Did you hear the amazing news? If you jump on the right day, a planetary alignment of Jupiter and Pluto will cause a decrease in gravity and you will be able to float in the air for five minutes! It’s definitely true because I read it on the Internet. Ok, you’ve got me. This isn’t true. Not in the least. It’s 100% grade-A hokum. Phil Plait, aka The Bad Astronomer, has debunked this more thoroughly than I could. It did make me wonder though: What would it take to float in the air for five minutes? How much would we have to alter the Earth’s gravity in order to accomplish this feat? 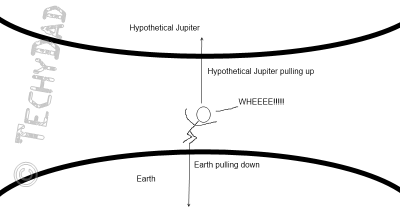 Or, likely more accurate to the “Zero G Day” myth, how close or massive would Jupiter need to be to accomplish this? Consider this a cosmic equivalent to the Mythbusters’ replicating the results. We can think of a jump using this diagram. Since the top of our jump is halfway through it, let’s further simplify matters by not calling this a five minute jump that we are going to attempt. Instead, we’ll say that it takes gravity two and a half minutes to slow our initial push-off speed to zero. In other words, the final speed is equal to the initial speed plus the product of acceleration (in this case, gravity) and time. That’s the initial velocity that our legs have provided us. But what about our “Zero G Day” jump? 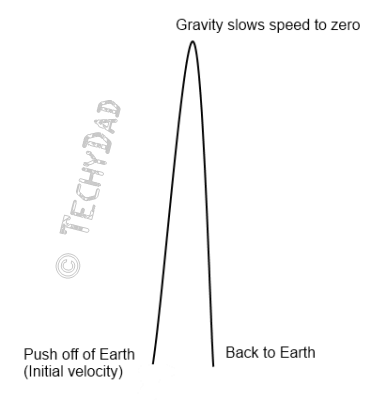 How small would gravity need to be to allow us to push off with the same force and decelerate to zero in 2.5 minutes? or an acceleration of -0.01078 meters per second2. Given that normal Earth gravity is 9.8 meters per second2, this would be a mere 0.0011g. How small is 0.0011g? Well, according to the Planetary Fact Sheet from NASA, if you were walking on the surface of the Mercury, you’d experience 0.378g. Maybe we need something smaller like our Moon? 0.166g. Let’s go to dwarf planets and look at Pluto. 0.059g. We still haven’t gotten to our “Zero G Day” gravity figure. Even Pluto has over 53 times the gravity we’re looking for. We might have luck with one of the smaller asteroids, but it would be a difficult search. G is the universal gravitational constant or 6.673 x 10-11 N m2/kg2. This isn’t to be confused with “little g” which stands for the gravity on Earth. Don’t worry if you are a bit confused, though, as you’ll see, G isn’t going to matter much. When you jump in our hypothetical “Jupiter Has Much More Gravity” situation, Jupiter pulling up almost as much as the Earth is pulling down. Now we can either solve for distance or mass for Hypothetical Jupiter. Let’s do one and then the other. First, we’ll assume that Hypothetical Jupiter is in its current orbit and will calculate how massive it would need to be. 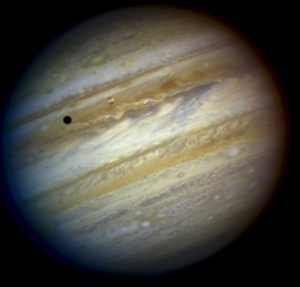 Next, we’ll keep Jupiter as massive as it is right now and just move it as close to the Earth as it would need to be. Plugging in Jupiter’s minimum distance from the Earth – 588.5 * 106 (source: NASA), we get a mass of 509,108.4 * 1029 kg. That same website gives the real Jupiter’s mass as being 1,898.3 * 1024 kg. So Hypothetical Jupiter would need to be 26.8 million times as massive as Real Jupiter. This is much more massive than the Sun is (1,989,100 * 1024 kg). Almost 25,600 times as massive, in fact. This would make our Hypothetical Jupiter, more massive than any star we know of. Perhaps this would even be massive enough for Hypothetical Jupiter to collapse into a black hole. With Jupiter’s mass (1,898.3 * 1024), this gives us a distance of a distance of about 113,600 km. At first glance, this would appear to put Jupiter less than a third of the distance between the Earth and the Moon (384,400 km). Actually, though, it’s closer than that. You see, the distance is measured as the distance to the center of Jupiter. Jupiter has a radius of about 70,000 km so this would actually make Jupiter only 43,600 km from the Earth. This would be only 11% of the Earth-Moon distance and would be a mere 8,000 km from satellites orbiting in geostationary orbit. At that distance, our Hypothetical Jupiter would not only let us stay aloft for 5 minutes, but would also pour tons of lethal radiation over the Earth. Not only that, but the Earth would probably be torn apart and fall into Jupiter. In short, be glad that you can’t jump and stay aloft for five minutes. If you ever find yourself able to do this, you might not be around for long to enjoy your air time. NOTE: The Jupiter image above is from NASA. 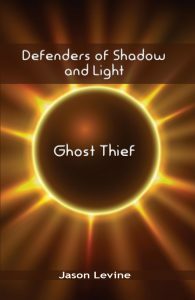 Superheroes, The Sun, and (Because) Saturn! I had three things I wanted to post about, but none of them seemed long enough for a post on their own. So here they are together in a mish mash of superheroes, science, space, and social media! First comes a bit of Geek Fail on my part. Recently, Cartoon Network released a large amount of their library on Netflix. As I drooled over the shows that I could share with my boys, I saw "The Powerpuff Girls." I laughed at it and, on a lark, decided to show them the show so we could laugh at it together. Never underestimate a geek’s love of superheroes, though. While I couldn’t take the show seriously enough to enjoy it, my kids loved it! Now NHL is determined to watch every episode. Geek Fail? Or perhaps Geek Win in that NHL loves superheroes so much that he even likes PowerPuff Girls. Next up comes a little video that NASA put together. You see, NASA launched the Solar Dynamics Observatory three years ago. Since then, it’s been regularly taking photos of the Sun. One photo every twelve seconds. For three years. It’s given scientists tons of data to prove and disprove theories about our favorite star. NASA has taken those photos and strung them together into an amazing four minute video showing some amazing details. Thanks to NASA images and videos being public domain for the most part (about the only ones that aren’t are items with the NASA logo or with people in the shot), you can download high resolution movies or still shots from this movie. A couple of days ago, Phil Plait (aka BadAstronomer) and Jenny Lawson (aka The Bloggess) started conversing on Twitter. Phil was tweeting a drive to press Congress not to cut planetary science at NASA. This is a very good cause on its own. Then, Jenny pointed out how "Because, Saturn!" was a good answer to anything. "Why do I have to eat my broccoli?" "Because, Saturn!" "Why can’t I watch TV?" "Because, Saturn!" "Why can’t I stay up late?" 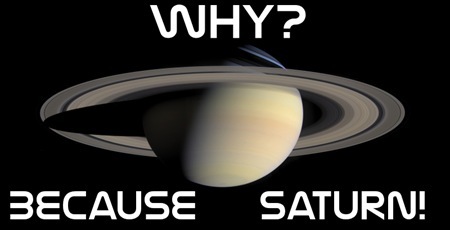 "Because… Saturn!" Jenny mentioned putting this on a shirt. While I haven’t done that, I did come up with this nice looking graphic. That image comes from NASA via the Cassini space probe. They stitched together 126 individual photos to come up with this 40 megapixel beauty. Of course, you can and should go to NASA’s website to look up some of their other wonderful photos. 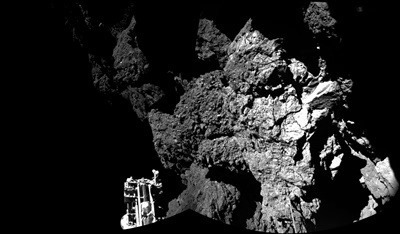 NASA makes getting great science and amazing images from millions of miles away look easy. So please click the link above to press Congress to give NASA funding for planetary science efforts. Why? Because, Saturn!